NEW YORK, NY – The Big East, in its heyday, was the most physical basketball conference in the country. Sunday night at the Garden, St. John’s and No. 24 Xavier reminded us that the new league is delivering that same type of physicality. With 21 (do not worry you are not reading it wrong) fouls called in the first half alone and 56 total, it was more of a heavyweight boxing match at the Garden then a basketball game. “I’m not old school, I’m new school Big East, but yes there were a lot fouls,” said Chris Mack.Xavier overcame a St. John’s rally to notch its Big East win total to five with an 82-77 victory over the Red Storm. Led by Trevon Bluiett’s double-double and Quentin Goodin’s career high of 16, the Musketeers outmuscled SJU on the glass, 45-26. Unfortunately, for the Musketeers, they could be without Edmond Sumner for quite some time as he went down with a scary looking knee injury and did not return in the second half. Sumner will have a MRI on his knee tomorrow according to Mack but that was all he knew. “Hopefully he is back on the court soon rather than later, but I really don’t know” said Mack. St. John’s staged a comeback after being down seven at the half. Led by freshman sensation Shamorie Ponds’ 23 points including an impressive 11-13 at the charity stripe, the Johnnies just did not have enough in the tank to make the full comeback. “The game is 40 minutes, you can’t really break it up into sections,” said St. John’s head coach Chris Mullin, who said progress was made by the Red Storm despite the defeat. 1. Fab Freshman Backcourt – Despite their struggles tonight (combined 34 pts on 10/25 shooting), the freshman backcourt of Ponds and LoVett is special. Both of them have the ability to break down the defense and kick it out. Two of the most exciting and fun players to watch in the conference are walking highlight reels. 2. Decision to go Big- Down the stretch, Coach Mullin elected to go big with Tariq Owens and Darien Williams, benching Bashir Ahmed. It paid off, as St. John’s was able to take control of the inside and “Storm” back. No Kassoum Yakwe though which was very, very odd. 3. 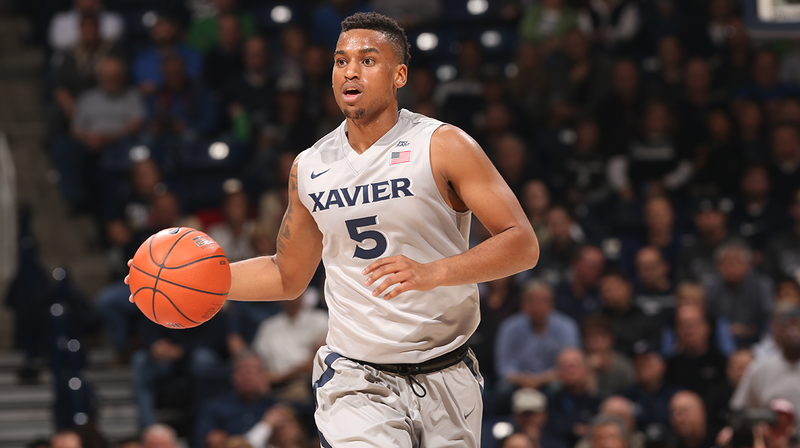 Trevon Bluiett is all Big East Material-He led the way for the Musketeers 21 pts and 10 Rebounds. The junior wing continues his roll of scoring after putting up a 40 piece on Cincinnati. Kid can absolutely stroke it from three-point land and an improving slashing game; it is only a matter of time before Bluiett is on draft boards. Whether he is drafted or not is yet to be seen, but with his jumper, he will find his way onto a NBA roster eventually. “He’s always been a really good player, but 21 and 10 here at the Garden, we needed every bit of it” said Chris Mack. 4. Sumner Injury– Sophomore Point Guard Edmond Sumner went down with a Knee injury late in the second half. After his departure, Xavier struggled to find any sort of offense outside of Bluiett. If he misses extended time, it could be a crippling loss for Xavier. This will definitely effect his draft stock as he has been trying to play his way back into the top 20. 5. Fouls, Fouls, Fouls– There was 56, yes 56 combined fouls called in the game. Forced both teams to use there benches extremely early in the game. Was Old-School Big East conference battle, reminded me of the highlights of when Mullin and Patrick Ewing Played. This game stops the Xavier (15-6) three-game losing streak and sets them up for another conference test against the Seton Hall Pirates (13-7) next Wednesday at the Cintas Center. St. John’s (10-13) will take on the Marquette Golden Eagles (14-7) Wednesday at MSG.